Echo Bridge Office Park | Haynes Management, Inc. Located at the Echo Bridge Office Park this suite offers a strong value. 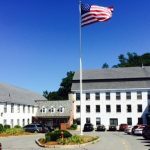 The suite is in a completely renovated brick mill building on the banks of the Charles River, situated in the southeast corner of Intersection of Route 9 and Route 128 (I-95) in Newton Upper Falls, near the Wellesley line. It is an ideal office location west of Boston for a small to medium size business seeking attractive office space in a prime location at reasonable rental rates.